Dreaming of an all-white kitchen but having nightmares about keeping it clean? 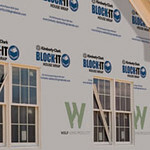 Let Wolf Home Products help! We've engineered products specifically for your toughest kitchen messes, so you don't have to worry about any spills, bumps, or accidental artwork from your kids. We’re excited to introduce Wolf Signature with SmartShield™ Technology, cabinetry designed for everyday life. Wolf Signature cabinets with SmartShield™ Technology are protected with an ultra-durable finish that looks like paint but is way easier to care for. These cabinets stand up to heat and moisture, resists most stains, handles scuffs and bumps, and won’t peel or delaminate. Spills can be easily wiped away with a damp cloth or sponge. SmartShield Technology wraps durable laminate around your cabinet doors. It provides long-term durability thanks to the wood and laminate combination. There's also a variety of finishes, so you won't have to sacrifice design trends for usability.With Wolf Signature with SmartShield™ Technology, easy cleanups are covered. The Wolf Signature with SmartShield™ Technology collection offers four unique door styles in four on-trend colors. Need cabinets quickly? 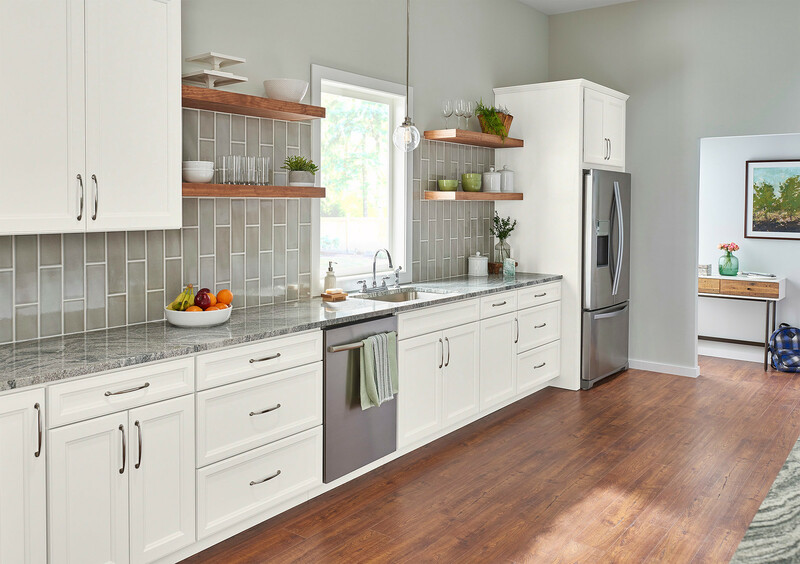 Our Livingston door style is available in four colors for Quick Ship delivery, meaning you get your cabinets in days, not weeks. Wolf Signature cabinets are also available in Maple and Birch, offering stylish wood doors that can be finished in the most sought-after paints, stains and glazes. Sometimes life is a hot mess – we get it. 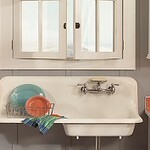 That's why Wolf Home Products designed cabinets that make cleaning kitchen messes a breeze. Spaghetti night? No problem. Scuff marks or a crayon attack? We can handle that. Our cabinets can resist food and beverage stains, heat and moisture and endure any bumps or nudges that you worry could cause a problem. Your kitchen is often the center of a house, and it should be a place where you move freely and don't worry about these everyday messes. We also offer storage solutions for your heavy pots and pans and oddly shaped bowls that you couldn't find a space for before. You'll always find what you're looking for with built-in island storage and customizable organization options. You also get to add extra details to your cabinets that fit your style. Decide on a type of molding, a decorative leg or a tulip foot to complete your kitchen design the way you want it. You don't have to live anxiously worrying about every scuff or food stain on your cabinets. With Wolf SmartShield Technology, you can get beautiful cabinets that are easy to clean, letting you enjoy the moments you spend in your kitchen. Wolf Signature Cabinets with SmartShield technology are an investment that will provide long-term durability in your home. Find a dealer near you to get started designing the cabinets of your dreams.